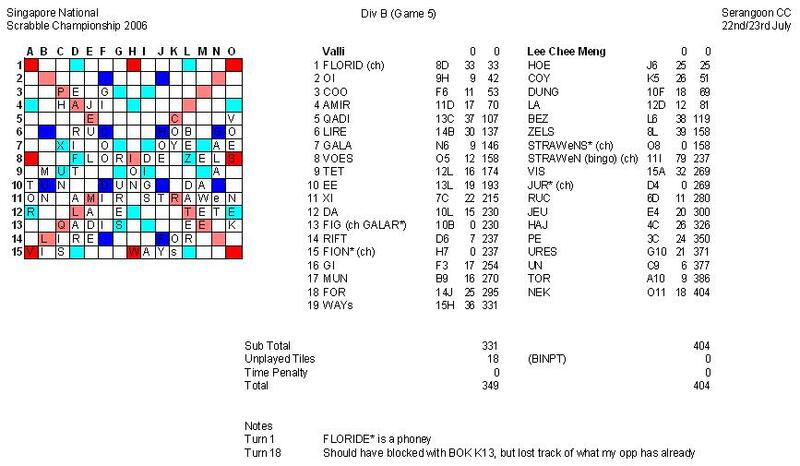 My first time playing Scrabble in Serangoon CC. After having lunch with Chew Chuah, I explored the CC before the start of the game. Saw a group of young ballet dancers practicing at the dance studio on the top floor and saw the nice exhibits at the polling station for lift upgrading! 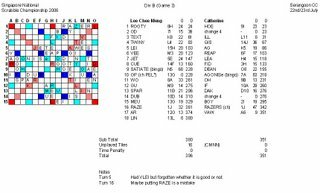 Opened with a bingo JUIcERS(92) and scored well with the Q and X. Was about 150 points ahead after my opponent had two phoneys: EnCLOVES* and LOV* back to back. 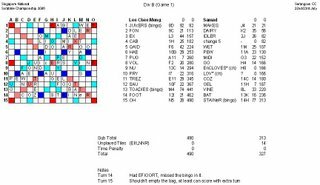 Had another bingo with TOADIES(74) and got a EFIOORT rack after that. Spotted the bingo but thought it may not be good. 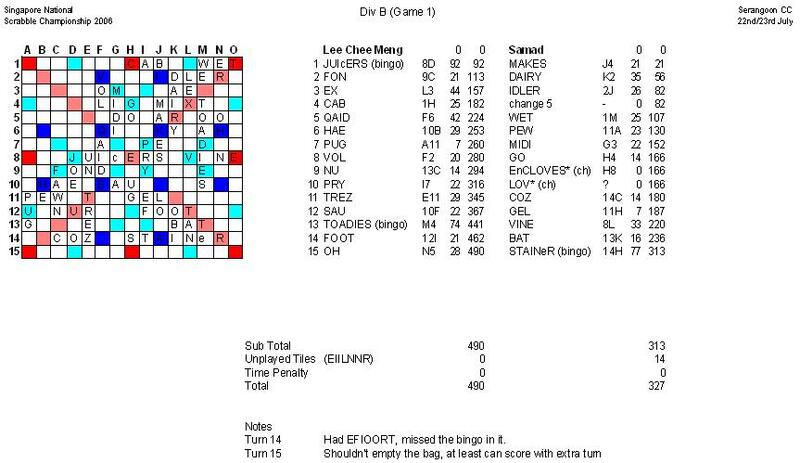 Allowed my opponent to bingo out with STAINeR(77). W 490-327, +163. 1W 0L (Accum spread +163). Held an AEEILY? rack at one time but failed to see the bingo in it. 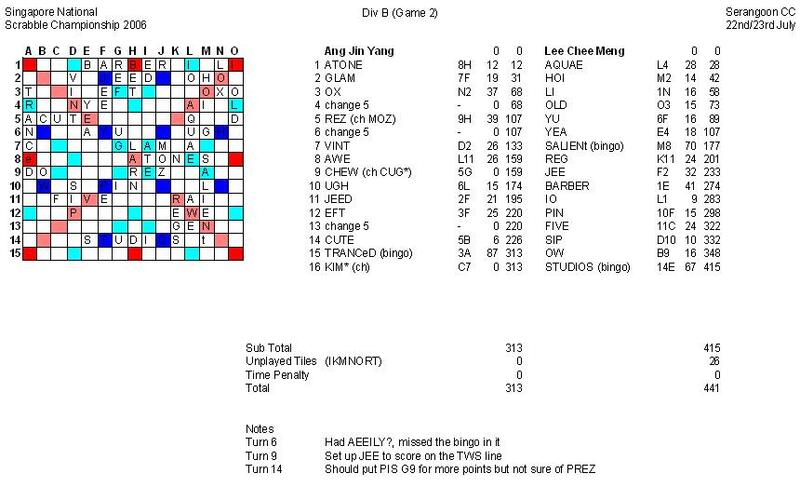 Bingoed with SALIENt(70) and later played JEE to set up for BARBER(41) across the TWS. Was quite lucky to have all the "S" in this game and I had three "S" on my rack at one time! 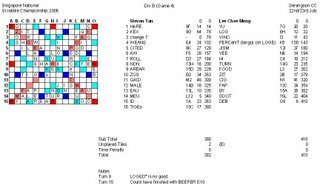 My opponent bingoed with TRANCeD(87) towards the end and I managed to bingo out with STUDIOS(67). W 441-313, +128. 2W 0L (Accum spread +291). Checked my records before the start of the tournament and I discovered that I had a 0-4 record against her! 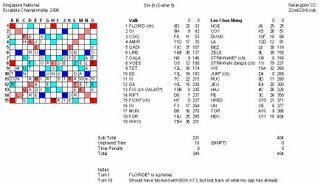 Bingoed first with SATIATE(68) and Catherine bingoed next with AGONISe(63). Our scores were very close throughout the game! Thought I could pull ahead with RAZE(32) but she scored more with RAZERS(47) to the TWS cell! Managed to "eat" her consonants after finishing my tiles first to win! W 396-351, +45. 3W 0L (Accum spread +336). 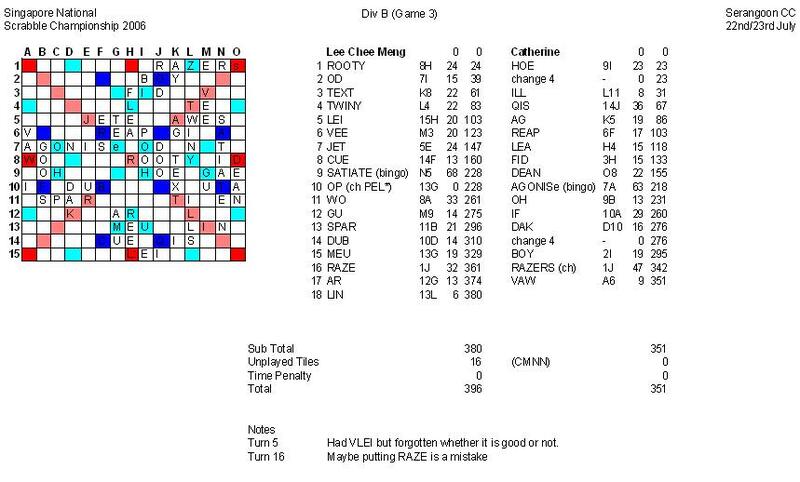 Was discouraged at first when my opponent scored well with KEX(64) on his second move! 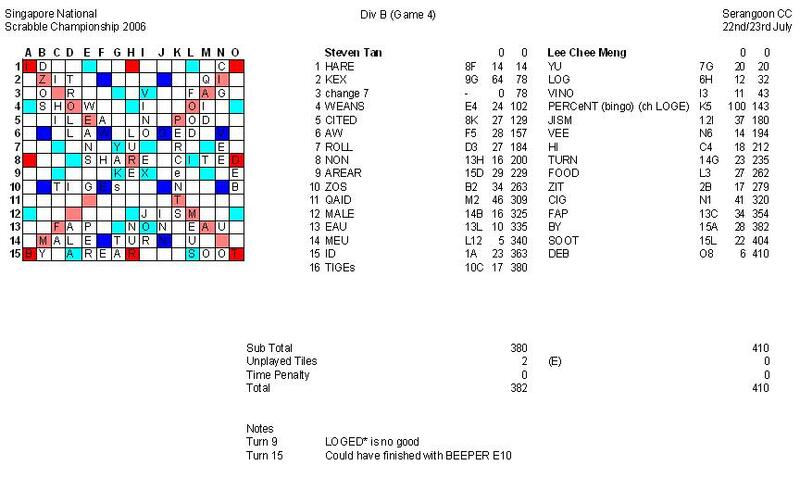 Managed to pull ahead with a 4-timer PERCENT back hooking to LOG that drew a challenge. Got away with a phoney LOGED* and scored consistently to maintain my lead. W 410-382, +28. 4W 0L (Accum spread +364). My opponent opened with FLORID and I back hooked an E to it. Thought it was the correct spelling until Jobeth told us that it was a phoney. Held an ANRSTW? 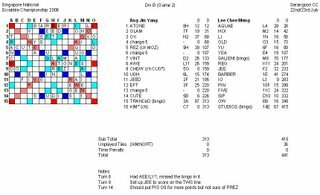 rack and remembered the bingo that Zi Peng played against me during the Millenium Cup but had to try if it took an S at the end as it scored a lot more down the TWS line. It got challenged off but luckily, there was another spot for me to bingo. Could have gotten a better spread if I stopped her from going out on the TWS line and not made a mistake on the submitted score sheet. W 404-349, +55. 0W 0L (Accum spread +419).